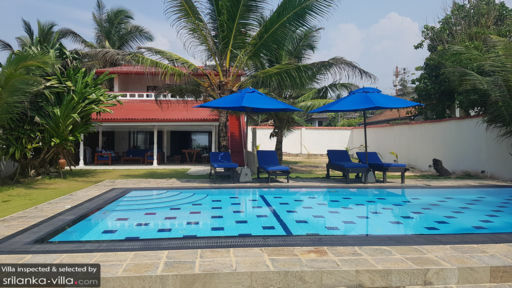 With 3 large bedrooms, a lovely private pool and spacious, shaded alfresco dining and living areas, this beautiful beachfront villa offers great value for money accommodating groups of up to 6 people. The superbly located, Tropical Beach House is the ideal setting for friends and family groups looking for their own private space to enjoy the serenity of panoramic ocean views. Tropical Beach House allows sunlight to enter the bedrooms through large glass windows which open straight out onto a semi-private balcony and veranda. Each bedroom features air-conditioning facilities and panelled glass. All ensuite facilites come with wet rooms, hot water showers and fresh towels. Set amidst swaying coconut palm trees, the focal point in the beachfront garden is the 10 by 5 metre private pool. The poolside area is furnished with sun loungers and large blue beach umbrellas allowing guests to cool off and perfect their holiday tans whilst enjoying the gentle rhythm of rolling ocean waves. Multiple semi-private living areas are found across the villa with 2 separate fully-equipped kitchens allowing making it ideal for groups of friends to enjoy their own privacy and cater for their own needs. 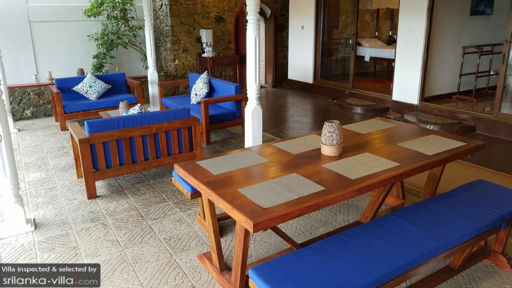 The outdoor living area under the expansive veranda offers a dining bench large enough to accommodate 6 people and locally-crafted sofas with maroon cushioning surrounded by roughly-hewn stone walls for just relaxing and enjoying the views. Broadband Wi-Fi internet access is provided for use indoors and outdoors. Tropical Beach House’s is fully-staffed with your own daily housekeeping staff, private chef, pool attendants, gardeners and villa security. If need be, babysitting services, car rental and chauffeur services, a well-deserved massage, laundry facilities, boat rentals and airport pick-ups can be easily arranged at a small charge. 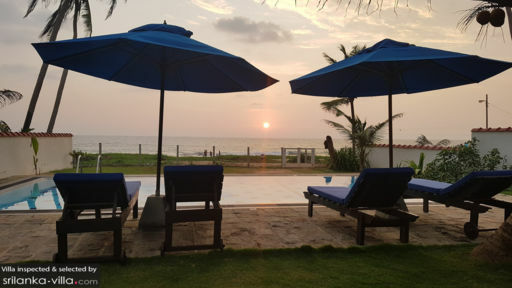 Located in the tranquil nooks of Hikkaduwa, guests are in for a meditative retreat. A drive out to oceanviews and watersports. Hikkaduwa is renowned for its diving and surfing sites. Tropical Beach House’s location allows guest to go snorkeling and go on nature walks to see the richly diverse ecosystem. Surely visit the Kosgoda Turtle Hatchery to see the best turtle hatcheries along the coast and help staff release baby hatchlings into the sea!